The Rohingya of Myanmar are one of the world’s most persecuted minority populations without citizenship. After the latest exodus from Myanmar in 2017, there are now more than half a million Rohingya in Bangladesh living in camps, often in conditions of abject poverty, malnutrition and without proper access to shelter or work permits. Some of them are now compelled to take to the seas in perilous journeys to the Southeast Asian countries in search of a better life. They are now asked to go back to Myanmar, but without any promise of citizenship or an end to discrimination. 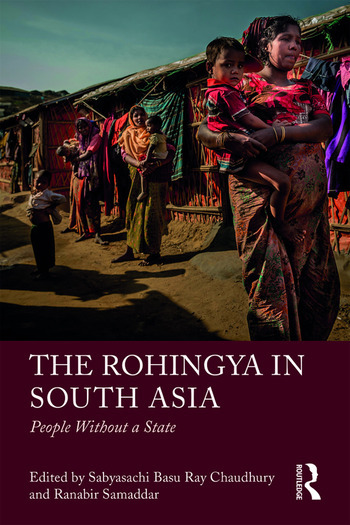 This book looks at the Rohingya in the South Asian region, primarily India and Bangladesh. It explores the broader picture of the historical and political dimensions of the Rohingya crisis, and examines subjects of statelessness, human rights and humanitarian protection of these victims of forced migration. Further, it chronicles the actual process of emergence of a stateless community – the transformation of a national group into a stateless existence without basic rights. Sabyasachi Basu Ray Chaudhury is a Professor in the Department of Political Science, Rabindra Bharati University, Kolkata, India. He is also Honorary Director, Centre for Nepal Studies, and is the founder Head, Department of Human Rights and Human Development at the same university. He has been the Vice Chancellor of Rabindra Bharati University since 2012 and is a member of the Calcutta Research Group. His areas of interest include international relations, South Asian politics, refugee studies and human rights. He is among the few experts in India on the Andaman and Nicobar Islands. He is a regular contributor to academic journals, periodicals, dailies, news channels and portals. His publications include Indian Autonomies: Key Words and Key Texts (co-edited with Ranabir Samaddar and Samir Kumar Das, 2005); Internal Displacement in South Asia: The Relevance of UN’s Guiding Principles (co-edited with Paula Banerjee and Samir Kumar Das, 2005); and Rights after Globalisation (co-edited with Ishita Dey, 2011). Ranabir Samaddar is currently Distinguished Chair in Migration and Forced Migration Studies, Calcutta Research Group, Kolkata, India. He belongs to the critical school of thinking and is considered one of the foremost theorists in the field of migration and forced migration studies. His writings on the nation state, migration, labour and urbanization have signalled a new turn in critical post-colonial thinking. Among his influential works are The Marginal Nation: Transborder Migration from Bangladesh to West Bengal (1999); Beyond Kolkata: Rajarhat and the Dystopia of Urban Imagination (co-authored, 2014); and Karl Marx and the Postcolonial Age (2017).